Morgan James Publishing, 9781630479800, 208pp. What happens to you, your team, even your entire organization when the business environment becomes more volatile and challenging? Have you noticed how some leaders continue to achieve breakthrough results under even the most difficult of circumstances while others' relationships break down, creating even more turmoil? Which of these leaders do you choose to be? 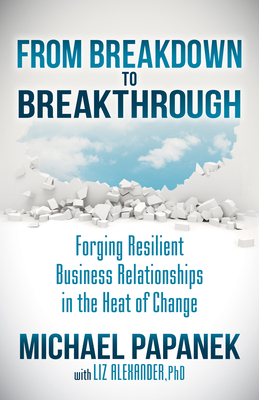 In "From Breakdown to Breakthrough," leading change consultant, Michael Papanek, draws on his experience, insights, and research with top executives to shine a spotlight on how anyone---even those whose business relationships have suffered in the heat of change in the past---can establish the resilient relationships required for a long-term track record of business success. From his early days working during the General Motors---Electronic Data Systems merger in Detroit, to launching his own consultancy in San Francisco just as the U.S. economy reached its nadir, author Michael Papanek learned first-hand why it is vital to ensure all business relationships are Strong, Flexible, and Fair. Weaving this knowledge into a model applied successfully by his clients within leading organizations including Apple, Google, and Yahoo , Papanek now offers this proven approach to any business professional wondering how to rise above the vicious cycle of relationship breakdown that many of us find ourselves in---especially during times of incessant change. The history of every company is always about key relationships that either led to long-term success, or breakdown. Some leaders seem naturally adept at riding what Papanek calls "The Heat Curve," emerging from volatile times with their relationships not just in tact, but enhanced. From Breakdown to Breakthrough shows how you can achieve that not just for yourself, but for everyone you work with. Over the past 25 years, leadership consultant Michael Papanek has advised top executives at the worlds best companies including Google, Microsoft, Yahoo!, Salesforce.com, Apple, Cisco, Sutter Health and Kaiser Permanente. His methods for creating resilient relationships during change are used by the likes of Telefonia, Chevron, Bank of America, AT&T, Sprint and Mercedes-Benz. As an expert on 21st century organizations, Papanek continues the legacy of his grandfather, Kurt Lewin, the psychologist known globally as the father of Organizational Development---the study of how human dynamics impact business results.